Did 2 Chainz Just Propose at the 2018 Met Gala? See for Yourself! 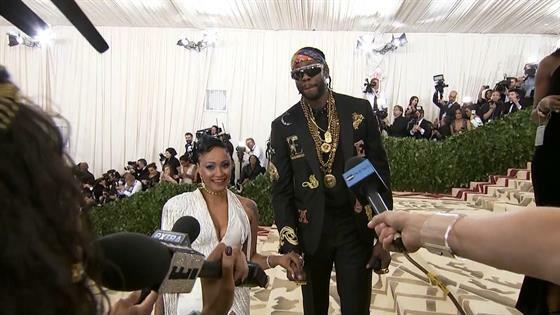 2 Chainz, whose real name is Tauheed Epps, hit the red carpet at the 2018 Met Gala and had more than striking a posing on his mind. While walking up the Met's famed stairs, the "We Own It" rapper got down on one knee and proposed to longtime girlfriend Kesha Ward! The two have three kids together, Heaven, Harmony and Halo. Needless to say Kesha accepted her main man's proposal—and the ring, of course! For the exciting night in NYC, the pair, who have often referred to each other as "husband" and "wife" but have not tied the knot, were outfitted in custom Versace. The annual event, which is themed Heavenly Bodies: Fashion and the Catholic Imagination, in New York City. The Met Gala is always held on the first Monday in May. Prior to popping the question, the rapper posted a video on Instagram while en route to the gala on his social media and wrote, "headed to #metgala2018." The rapper said, "You look good baby. "Thank you, baby," Kesha responded. Who says that romance is dead?! 2 Chainz will perform "Proud" on Jimmy Kimmel Live! this Wednesday.